It is in the public interest to build a culture of preparedness. The federal and state governments haven’t necessarily failed to do this because it’s not really their duty. It is the local governments, cities and counties, who should be doing this. Preparedness for catastrophic events is a local responsibility. We must build a culture of preparedness locally to ensure our citizens a better chance of survival should something catastrophic happen. The state and federal governments should support the local efforts with policy, funding and resources. In fact, the first Strategic Goal in FEMA’s 2018-2022 Strategic Plan, is to build a culture of preparedness. What we should take from these statements is that “We”, the people, need to be ready to take care of ourselves and families, our neighborhoods and our communities should a natural or man-made disaster happen. We must reignite the self-reliant spark that our great grandparents had. We are currently generations removed from that ability, unfortunately. Survival is a local issue, not something we should leave for the federal or the state governments to do for us. We must act in our own rescue and recovery like many of the citizens in Houston, TX did when Hurricane Harvey hit them in 2017. But we must do one better and build a culture of preparedness prior to an event. Our survival depends on it! Luckily, the people of the Houston area were not alone in their rescue and recovery efforts, as the whole nation responded to help with manpower, equipment and supplies. This may not be a luxury for all future disastrous events. There are even worse disasters lurking out there that most Americans have never heard of, nor do they understand the seriousness of the threats. Threats such as natural and man-made electromagnetic pulse (high-altitude nuclear burst EMP, GMD (solar storms/flares) and energy directed weapons), cyber attacks and physical attacks on our critical electrical infrastructure. There has also been a lot of press reporting about both the US and world economies slowing down resulting in a possible major financial crisis much worse than 2008. All of these potential events could be seriously life changing for our local citizens and our economy. Administrator Long hinted at it and the 112th US House of Representatives Resolution 762 stated it more boldly. After World War 2 the United States instituted a civil defense corps to help prepare our nation for the threat of a nuclear exchange with the former Soviet Union. Their mission was to prepare, train and organize the civilian population for such a catastrophic event. Today, we face even more threats that are potentially as bad, or worse than a nuclear exchange with an enemy. The emergency management structure of today is much different, their focus isn’t on the citizen, but on the continuity of government and continuing the services they are commissioned to provide. The very limited manpower staffing and even smaller budgets means the local Emergency Manager can’t add more to their plate. That leaves the citizens out of the equation. This must be fixed, but can it be? The answer is yes, with a community-based civil defense organization (e.g. H. Res. 762) that is partnered with the local emergency manager through the Voluntary Organizations Active in Disasters (VOAD) and worked into the training and activation plans. The difference is that the civil defense organization, as a 501(c)(3) tax-exempt non governmental organization (NGO) will work on pre-disaster mitigation through pre- and post-disaster preparedness training and also in disaster recovery methods. The local government will acknowledge the civil defense corps by approving a Resolution(s) that would inform the local citizens of the serious nature of these threats we face, the failure of both the state and federal governments to provide guidance to the city/county and the initiative taken by the city/county government to resolve this discrepancy. This resolution, or a separate one, will also speak of the need for partnering with a local civil defense organization as a way to involve the community in the process of preparing for serious disastrous events. If one is not currently organized in the jurisdiction, leaders could be sought from the community and negotiations begun to form one and begin a partnership to mitigate this shortcoming. Out of all the models for building a resilient local city or county, what we call continuity of community, the only one that fully addresses all of the areas needed is a reformed civil defense model. Civil defense is what the community needs to meet the various serious threats of today and civil defense should be promoted in every city and county in the country. The federal and state governments have failed to enact the proper safety measures to protect the public from these many threats. It is imperative to the public interest now for the local governments to partner with their citizens and prepare for these very serious potential events and lesser threats. Posted in Features and tagged Resiliency. 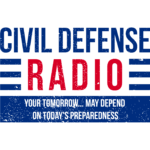 You and your families are the reason we are doing this radio show, so please show your support for our mission of informing you and the nation about the need for a New American Civil Defense Structure by donating to keep us going and making this site better. *This donation is Not tax deductible.